Vienna, originally a Celtic settlement, was subject to attacks and Barbarian invasion that reduced the town to ruins by the early 5th Century. By the 10th century, the German Babenberg Dynasty acquired Vienna and in the 13th century Vienna fell under control of the Habsburg. Today, Austria’s capital is home to 1.9 million people. Despite Vienna’s large size, its city center, located inside the Ringstrasse, is easily walkable. We began our walk through the Volksgarten across from the beautiful Burgtheater. Normally lined with budding rose bushes, the winter found them wrapped in protective canvas bags. From the garden, we strolled through the Hofburg Complex. The Hofburg Complex began as a small fortress is 1275. It was the seat of Austrian power for over six centuries. As such, each ruler expanded the complex, turning it into the palace it is today. The large complex includes the offices of the president of Austria, former imperial apartments and treasuries, several museums, a church and a chapel, the Austrian National Library, and the Spanish Riding School. From the gardens, we entered Josefplatz, a square tucked within the palace buildings that features the statue of Joseph II depicted as a Roman conqueror. The sculpture illustrates the Hapsburg belief that they were descendants of ancient roman emperors. We carried on to the Spanish Riding School which was founded in 1572. The school trains Lipizzaners and holds shows for the public. Morning exercise may be seen on weekdays from 10-12 for 15 Euros. The school puts on weekend performances and ticket prices range from 25 to 217 Euros. It is also possible to schedule a daily tour of the school for 18 Euros. We stopped only to see the riding stables and the horses in their stalls. From there we popped into Michaelerplatz, lined the Hofburg complex and the Church of St. Michael. 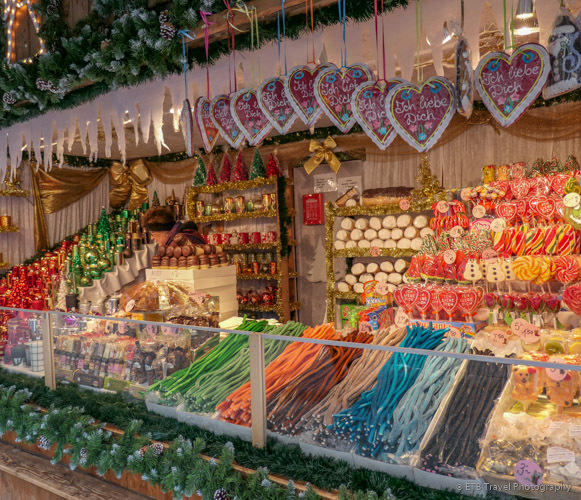 It is also and home to a Christmas market in December. The pedestrian area, Graben St. is only a block away and soon we found ourselves meandering past stores, restaurants and coffee shops. Graben St. used to be the Old City’s moat. Today, its most striking attribute is the ornate Plague Pillar which commemorates Vienna’s escape from the epidemic in 1679. We followed Graben St. to Stephansplatz named for Stephansdom, the finest Gothic church in Austria. The cathedral, constructed in the 12th Century, was built over the remains of a Romanesque sanctuary. Entrance into the magnificent structure is free. We took a quick peak inside before exploring the surrounding Christmas market which highlights the usual mulled wine, bratwursts, ornaments, hat, scarves, and more. From the Stephansplatz, it is a five-minute walk through a pedestrian area on Kärntner St to Staatsoper, Vienna’s opera house which opened in 1869. The opera house was rebuilt in 1955 after a bomb destroyed it during World War II. The world famous opera house features 350 performances of over 60 ballets and operas each year. Across the street from the opera house is Café Sacher, famous for the original chocolate layered Sacher cake. For the original, eating at the Café Sacher (and waiting in line) is necessary. Otherwise, many cafes offer the traditional dessert choice. Our tour guide recommended Sluka, which is located on Kärntner St between the opera house and the cathedral. I ordered beef broth with a semolina dumpling and Kristin had a double expresso. It was a nice way to rest and warm up on this dreary winter day. Two other places our local guide recommended to visit to experience the Austrian way of life were Beisel and Café Hawelka. They are both next to each other on Dorotheergasse, just off Graben St., the main pedestrian way. After our snack, we weaved our way along a few side streets back to where we started our day. Across the Ringstrasse from the Burgtheater, is Rathausplatz, home to Vienna’s largest Christmas market. This market included a much wider range of products such as wooden puzzles, teas, candles, soaps and much more. Located on the west side of the square is Vienna’s Rathaus, or New City Hall. The city hall was constructed between 1872 and 1883 in a neo-Gothic style. The imposing building, which currently houses the offices of the Mayor of Vienna, features five towers and 1,575 rooms. It is quite beautiful and perfect backdrop for Vienna’s largest Christmas market.